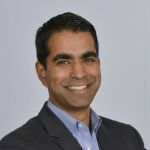 Anupam B. Jena, MD, PhD, is the Ruth L. Newhouse Associate Professor of Health Care Policy at Harvard Medical School and a physician in the Department of Medicine at Massachusetts General Hospital. He is also a faculty research fellow at the National Bureau of Economic Research. Jena’s research focuses on health economics and policy, including the economics of physician behavior and the physician workforce, healthcare productivity, medical malpractice and the economics of medical innovation. He served on the Institute of Medicine Committee on Diagnostic Error in Health Care. In 2007, he was awarded the Eugene Garfield Award by Research America for his work demonstrating the economic value of medical innovations in HIV/AIDS. In 2013, he received the National Institute of Health (NIH) Director’s Early Independence Award to fund research on the physician determinants of healthcare spending, quality and patient outcomes. In 2015, he was awarded the International Society for Pharmacoeconomics and Outcomes Research New Investigator Award. Jena graduated Phi Beta Kappa from MIT, and received an MD and a PhD in economics from the University of Chicago, where he was funded by the NIH Medical Scientist Training Program. He completed residency in internal medicine at Massachusetts General Hospital. There are challenges of value-based pricing and health technology assessments. Analysis of earnings data from two national surveys found pay gaps in physician income by race and gender, with male physicians earning more than female physicians and white male physicians earning more than black male physicians. This study estimated the social value of reducing low-density lipoprotein cholesterol levels by 50% for patients in the two highest statin-benefit groups and found that PCSK9 inhibitors may have considerable net value depending on the prices payers ultimately select. This study describes the unique value created by treatments that spare organs from failure and thus conserve donated organs for transplant into others, using hepatitis C virus as a case study. This study considered whether warfarin use is associated with an increased risk of serious hypoglycemic events among older people treated with the sulfonylureas glipizide and glimepiride, and found that, in quarters with glipizide/glimepiride use, hospital admissions or emergency department visits for hypoglycemia were more common in person quarters with concurrent warfarin use compared with quarters without warfarin use.